ChoirFest will get Bognor Regis singing! The team behind ChoirFest are bringing a festive edition of the popular event to Bognor’s Alexandra Theatre. 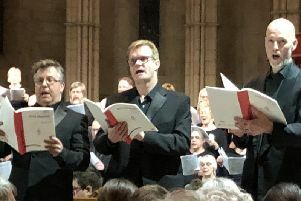 Choirfest at Christmas will see five community choirs come together in a festival concert perfect to get audiences in the Christmas spirit, promises co-organiser Will Hackett. “It takes place on Saturday, November 25 at 7.30pm, and the evening concert will feature many popular – and a few less well-known – festive songs. Taking part will be Arun Acapella from Bognor; the Igloo Choir from Wickham; Brighton and Hove Operatic Society Show Choir; the RAFA Choir from Bognor and Inspirations from Littlehampton. Tickets are on sale from the Regis Centre and can be bought online by visiting www.alexandratheatre.co.uk or by calling the box office on 01243 861010. “The choirs will arrive during the day, late morning, early afternoon, and they will rehearse on stage and watch each other. Meanwhile preparations are already under way for Choirfest 2019 which will take place over the weekend of March 16-17. “With ten choirs now confirmed, this will be the biggest event yet bringing together a host of community choirs from across the region, coming together for the weekend culminating in an evening festival concert showcasing their unique tastes and talents through music. ChoirFest was launched last year by Arun Arts working in collaboration with Bersted Arts – both based in Bognor Regis.